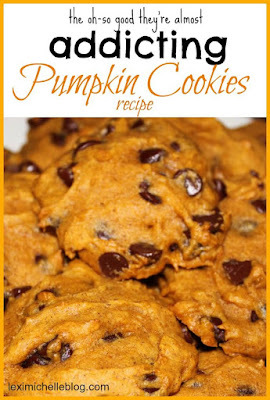 Alright so today I am going to share my ABSOLUTE FAVORITE pumpkin cookie recipe. I know, I know, it is not really pumpkin season. People typically think of having pumpkin treats in the fall around Halloween and Thanksgiving, but I broke away from the norm and made these the other day. P.S. I doubled the recipe and made around 6 dozen pumpkin cookies and they were all gone within ONE DAY! No lie! I probably ate about a third of them and my husband ate the other two-thirds! I'm not allowed to make these anymore until he has a six pack he said lol I guess they are just too hard to say no too! Combine pumpkin, sugar, vegetable oil and egg in a small bowl. In a separate bowl, stir together flour, baking powder, cinnamon, and salt. Dissolve baking soda with the milk and add to mixture. Drop by spoonful on greased baking sheet and bake at 350 degrees for 8-10 minutes. worth a try! Love your blog!! will follow!